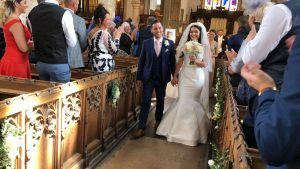 My blog this month is about the first special moment of any wedding – when the Bride makes her entrance in to the ceremony and walks down the aisle. Music choice is very important for the Processional (entrance of the Bridal party) and the Recessional (exit of the Bride & Bridegroom). The Bride can choose something as a surprise for her husband to be for her entrance, or they can choose together music that has meaning for them both. At a church wedding many – but by no means all – still choose the traditional Bridal Chorus (Here comes the Bride) by Wagner for the processional and Mendelssohn’s Wedding March for the recessional. Both can be played on the church organ, or you may book a string quartet, harpist or pianist to play modern arrangements. When the ceremony is held in an hotel or wedding venue – usually the same place as the celebrations are to take place – there is a lot more scope to choose more contemporary music. Worth noting that you are not allowed anything religious and the music should be cleared with the Registrar’s office before the day. You can have a singer, string quartet, harpist, or prepare your own CD to be played. Bear in mind that you will also need music to be played during the signing of the register. It used to be that the Bridesmaids followed the Bride and her Father, but these days it is more often the Bridesmaids who precede the Bride. If there are page boys and flower girls they will go ahead of the Bridesmaids. The flower girls may scatter rose petals as they walk down the aisle. You should have a rehearsal at the church or the venue before the day to make sure everyone knows the order they are to enter and also where they will be sitting. 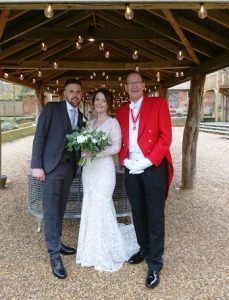 Your wedding planner or toastmaster can assist you in sorting these details and ensuring there are the correct number of seats left free at the front. The Bridal party should take their time entering, allowing the music to play a little before starting to walk down the aisle. If it is a short aisle try taking one step at a time in sync with your father (left, together, right, together etc.). This will avoid walking out of step and help you savour the moment by making it last longer. 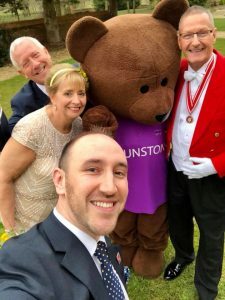 At ceremonies held in the same venue as the wedding breakfast your toastmaster can announce you into the ceremony – “Ladies and Gentlemen would you please stand. Accompanied by her Father and attended by her bridesmaids – Your Bride”. Cue music and away you go! 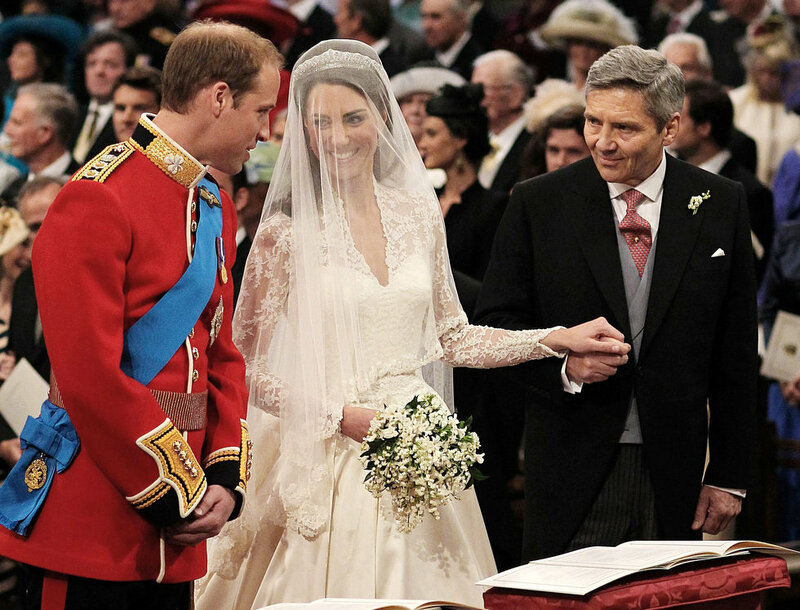 Don’t forget that the Father (or whoever is giving the Bride away) is on the Bride’s left arm. When they reach the front the Bride will have the Bridegroom waiting on her right hand side. My tip for remembering which side is ‘The Bride has left her Father for her right hand man’. At the conclusion of the ceremony when held in an hotel or wedding venue, the Registrars final act is to hand over the wedding certificate. 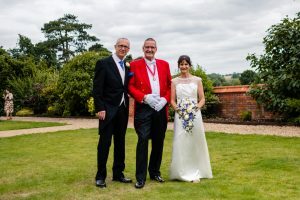 They will then introduce the new Mr & Mrs However, if you have booked toastmaster bob he may, with the permission of the registrars, come forward at this point to advise guests of what is happening next i.e. where drinks and photo’s are happening, and then introduce the new Mr & Mrs. The recessional music will then start and he will lead the Bride and Bridegroom from the ceremony. The rest of the Bridal party – parents, bridesmaids etc. will follow. This entry was posted in Diary and tagged aisle, Blog, bride, walking on July 8, 2016 by Bob Lloyd. Bob made our day so much more enjoyable! Our guests loved all the little extra touches especially the children!! Dear Bob, we would like to say a big thank you for all of your help on our very special day. You were fantastic throughout the whole wedding experience and made my life stress free!! The day was perfect and that was down to a lot of your help. Thank you.